The Sagamu-Lagos end of the Lagos-Ibadan Expressway reconstruction will be completed by 2021, the contractor, Julius Berger, has said. Reacting, Gaya and other members of the committee, who were on an oversight visit to road projects in Lagos, stated that they were not happy about the slow pace of the work, despite the efforts and funds that had been put into it. 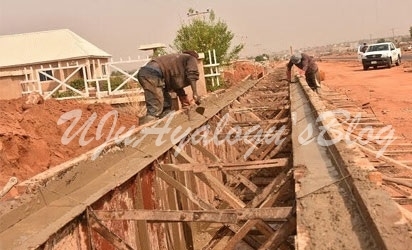 He revealed that the Federal Government had spent a lot of money on the road and others across the country and had moved cost of road infrastructure from N500bn to 600bn in the 2019 budget to accommodate more road construction. “The project is good as it will take care of traffic but we are not happy with the speed and so we expect the contractor to increase the pace of work, even though there were amendments on the road,” he said. Gaya also told journalists that the contractor of the Tin Can Island Truck Park, Borini Prono, had said that the project, expected to ease traffic congestion around Apapa Wharf, would be completed in December. He said the project had reached 97 per cent completion while construction of the shoreline, recently added to protect the park, had commenced. He said, “When we visited this site in 2015, the construction was less than 70 per cent; now it is 97 per cent because money has been paid and we insist that it must be finished by December. The committee also inspected the Apapa Wharf Road, a two-kilometre concrete road being constructed by AG Dangote and expected to be completed before the end of the year; the Leventis Bridge, which is expected to be completed by Julius Berger by the first quarter of 2019; and the Third Mainland Bridge, which would be partially closed in 2019 for rehabilitation. Other roads inspected during the tour were the Ikorodu-Sagamu Road being handled by Arab Contractors with a completion date of 2021, and the 1.5km NNPC Mosimi Access Road, which had been stalled by a debt of N1bn.